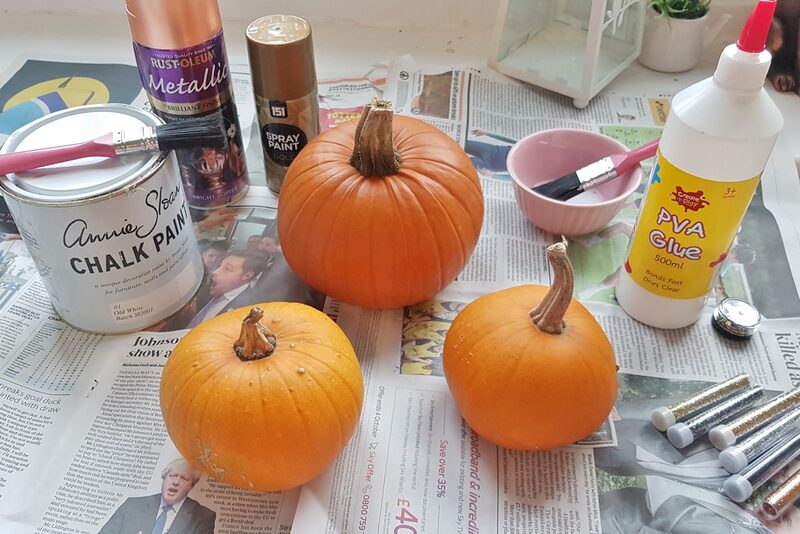 There are so many different ways to decorate pumpkins but I decided to paint mine; so off I went to Hobbycraft and Poundland to pick up some supplies. I managed to find a gold spray paint can in Poundland which was exactly what I needed, and I also bought a pack of ‘Halloween’ glitter tubes for only £1 from Hobbycraft. 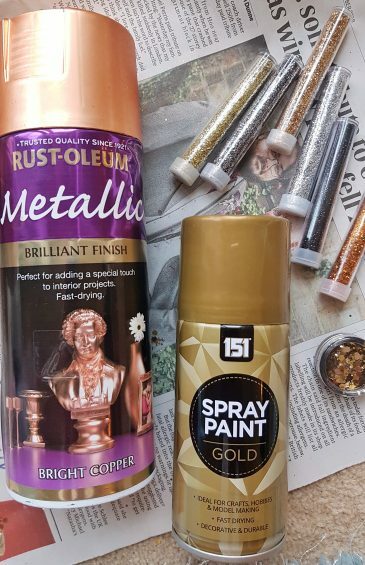 I already had some other paints at home that I could use including Rustoleum’s bright copper spray paint (which I had been dying to test out on a project! ), Frenchic chalk paint in pastel pink and some Annie Sloan white chalk paint. I thought chalk paints would work best for this as it applies so easily to everything and leaves a nice opaque finish. 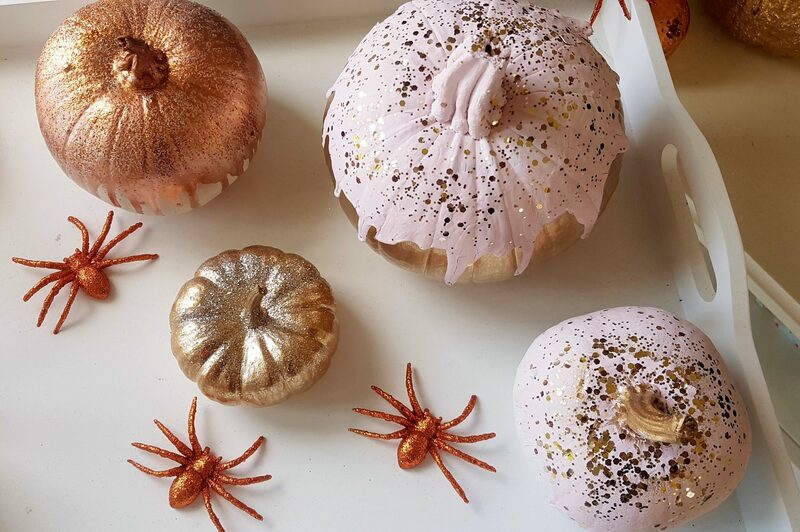 Decorating the pumpkins was pretty easy, it was the deciding what designs to do that was the hard part! Pinterest played a part in inspiring me but some designs were clearly too complicated for me to try. 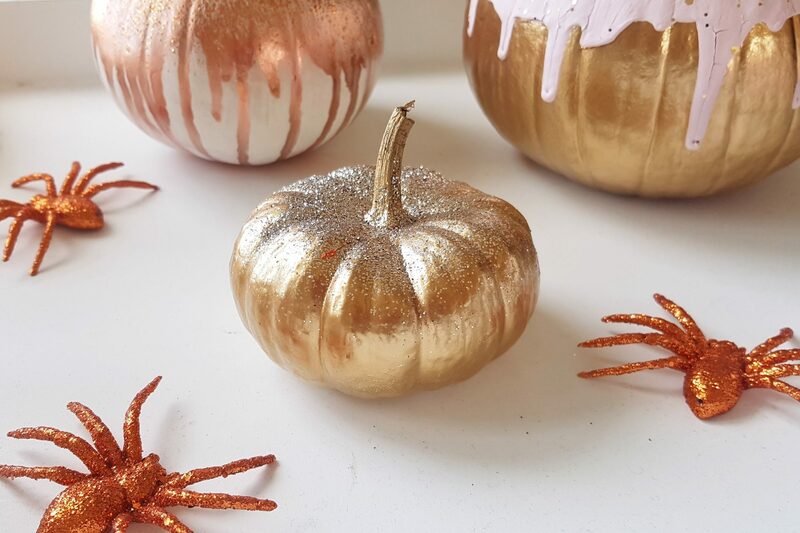 Firstly I decided to test the gold Poundland spray paint on the little munchkin pumpkin (£1 in Lidl) and was quite surprised by the really nice metallic finish and how easy it was to use. I then added some silver glitter on top whilst the paint was still wet so that it would stick without the need for messy glue. I was pretty pleased with how it turned out! I then decided that I wanted my next one to look like a pretty pastel pink drippy cake, so I painted it with a coat of white chalk paint and then applied the pink paint to the top half. I didn’t bother waiting for the white paint to dry before I added the pink.. I’m too impatient! But it turned out quite nicely; I applied the pink paint thickly so that it would drip down the sides and I was quite happy with the finished effect! I then added a topping of gold glitter to look like sprinkles and spray painted the stalk gold.. I think this might be my favourite one! I thought I’d do a similar thing with the next pumpkin. 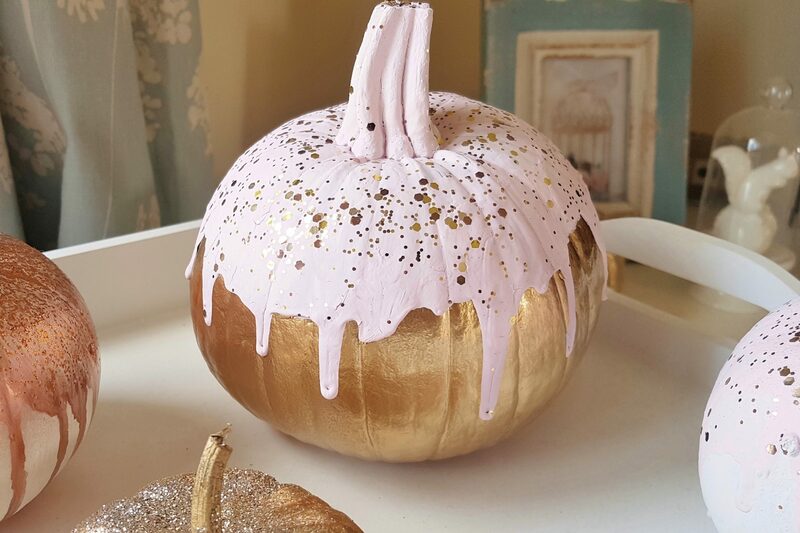 My biggest pumpkin I spray painted gold all over and then added the pink paint to the top again to drip down the sides, plus more gold glitter! 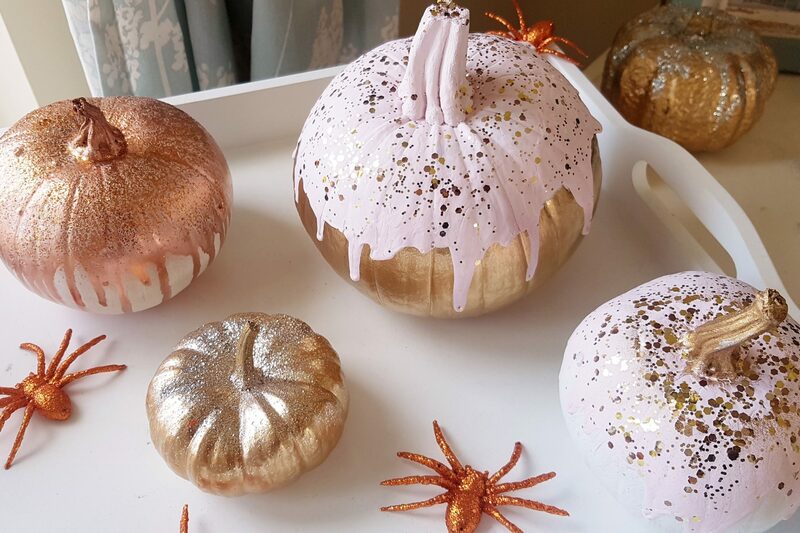 I wanted them to be super sparkly fairytale pumpkins! For my last one, I wanted it to be a bit more ‘Halloweeny’ so I decided to use the copper spray paint on this one. 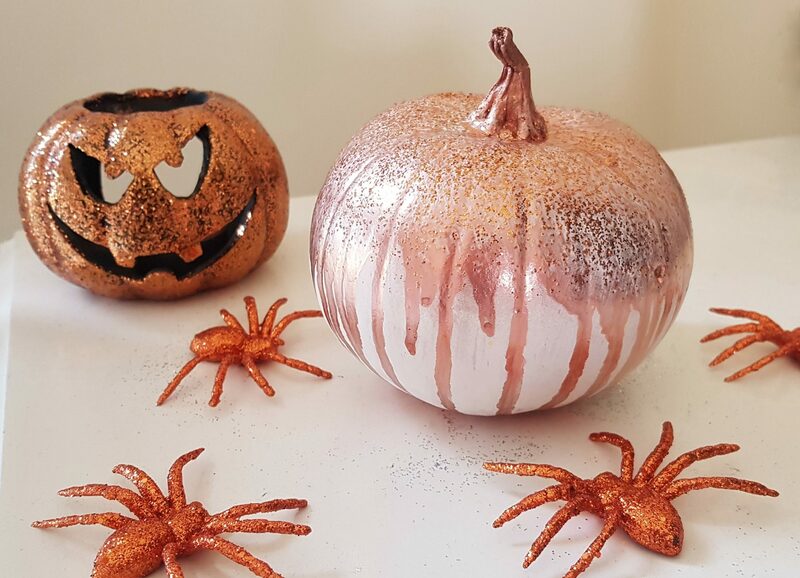 I gave the pumpkin a base coat of white chalk paint and then used the copper spray paint to drip down the sides like spooky Halloween blood. This spray paint was a bit harder to use than the gold paint as it seemed runnier, but as that was the effect I was going for it actually worked out okay! Overall I’m very pleased with how my pumpkins turned out and I will be sad to see them eventually go! Although luckily they last for a good few weeks so I won’t be getting rid of them for a while yet! 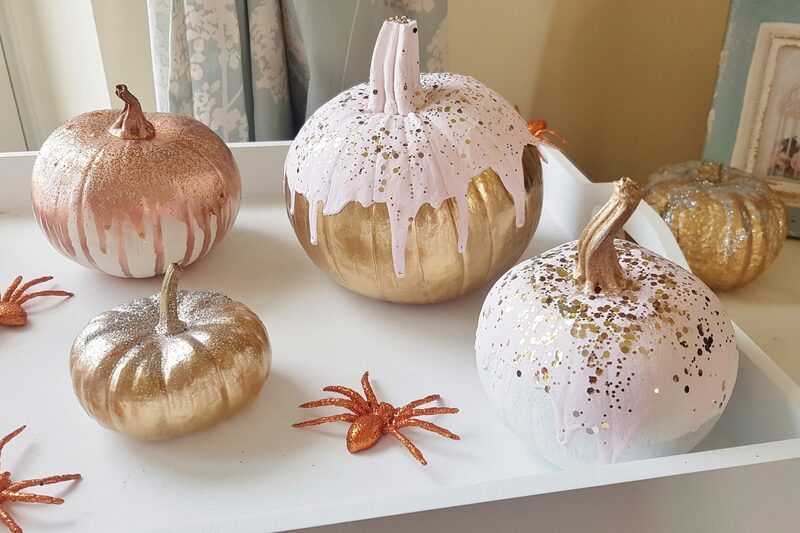 So those are my pumpkin designs that you can use for inspiration if you want to try and create something similar yourself! 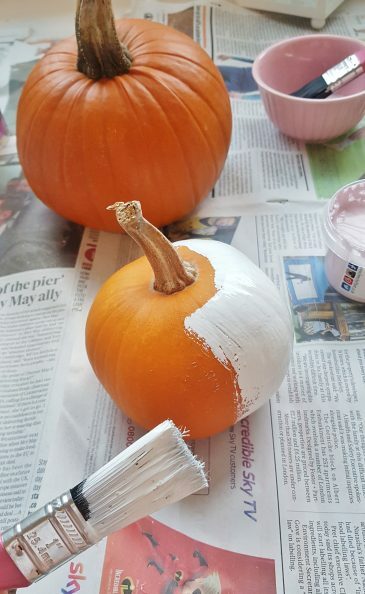 I hope this helps you to paint your pumpkins for Halloween! So wonderful! I loved this post!